Kimber Leigh Writes: Release Event: Grimnirs by Ednah Walters - Excerpt, Review & Giveaway! 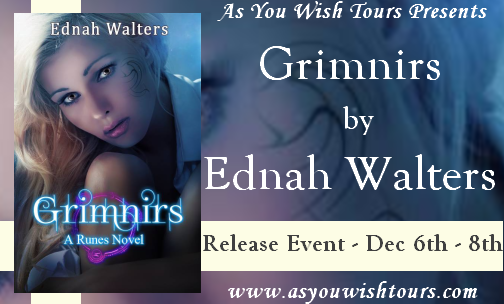 Release Event: Grimnirs by Ednah Walters - Excerpt, Review & Giveaway! “Now see what you made me do.” I eased off the brake. Ahead, Dad’s truck was nowhere in sight. “Sorry about that,” Echo said, but he didn’t sound or look it. He reached out and lifted the hair on my right shoulder. “Can’t help it.” He planted a kiss on my neck. The car swayed as I momentarily lost control. “You smell amazing.” He trailed kisses up my neck to my ear and inhaled. The sensations that invaded my body were downright frightening. Not even Eirik had ever made me feel like this. If I could forget Echo was a lunatic and I was losing my mind, I would have enjoyed the sensation. I reached up and tried to push his head away, but it was like moving a boulder. Worse, my hand sunk into his hair. It was silky, and for one brief moment, I wanted to run my fingers through it, maybe hold his head in place and savor the moment. 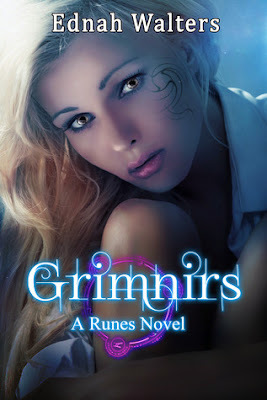 Grimnirs is book #3 in the Runes series. I haven't read any of the other books, and I don't think that impacted my enjoyment in the least. This is an urban fantasy featuring Norse mythology which is rather timely with the recent release of the latest Thor movie. This story starts out interesting, pulling the reader in from the very first page. I will admit that I wish I had read the other books in the series and will pick them up when I have the chance. Cora's memories don't quite mesh with what she's seeing. While she thought she was stuck in a mental institution, she was also at school acing tests, updating her vlog, and juggling three guys. She's confused, especially given the mountain of evidence that suggests it really was her in both places at once. Poor Cora, saddled with overprotective parents, friends who keep her in the dark, and a gorgeous guy she wants but who thinks it's chivalrous to deny himself the pleasure of her company. Romantic interest Echo is a swoon worthy alpha-male. Something about the way Ms. Walters wrote his character really got my motor humming. The feelings he has for Cora are so strong and sweet. He's equal parts strength and wit combined with just the right amount of angst and heartache, all wrapped up in a delicious exterior. One word for Echo: Yummy. The story is mysterious and fun; it's just really good from beginning to end. Ms. Walters does an excellent job building suspense about Cora's memory dilemma. I think my favorite part was the characters, the way they interacted and the dialogue. 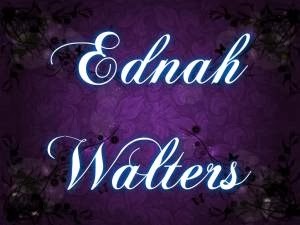 The ending was especially satisfying, which should send any reader to Amazon in search of more Ednah Walters books. 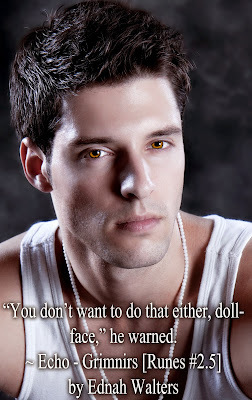 Grimnirs is an upper YA fantasy romance due to mature content and sexual situations. I recommend it to ages 17+. If you enjoy mythology, you'll love this novel. 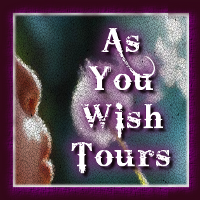 The fantasy is intriguing and the romance sweet, just the way I like it.